The 2013 GARBC Christmas project will provide online training scholarships for pastors, associates, and leaders. Often pastors and ministry leaders would like to further their education, but pursuing theological and ministry training is expensive and often requires travel. Our Regular Baptist Web Community provides quality ministry instruction at a modest price. Send your Christmas gift to the GARBC and provide online education scholarships through the Regular Baptist Web Community. You will make a pastor’s day! Donate now. It just got easier to network within our association! New this year, we are releasing a digital version of our annual GARBC directory. • The print version is still available, but this digital PDF will save you time trying to figure out where you last left the directory. • We’ve added links to nearly every page, allowing you to connect faster to our association’s network! • Add this PDF to your mobile device or tablet to increase portability! Buy your digital copy online at RBPstore.org/directory. The Council of 18 had a productive and positive meeting Nov. 18–20 at the GARBC Resource Center in Schaumburg, Ill. The council’s work included the following items: approving strategic goals for the association’s future, approving a chaplaincy policy on marriage, affirming that churches in the association are Baptist, finalizing details for the 2014 GARBC Conference and initializing plans for the 2015 GARBC Conference, developing a succession strategy for administrative team members, and positioning the business model for relocation of the GARBC Resource Center. Continue to pray for the Council and for the GARBC administrative team as they work on these major projects. To God be the glory for His help and blessing! 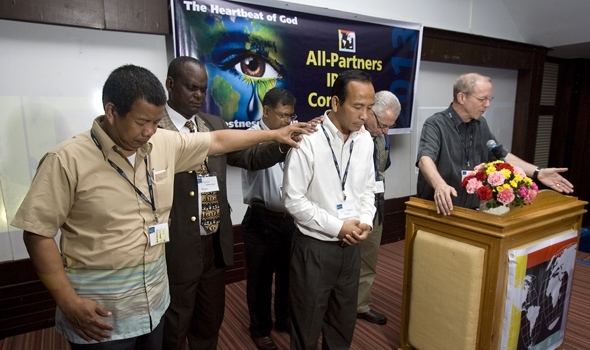 Eighteen partnering associations from ten countries participated in the 2013 All-Partners IPFBM (International Partnership of Fundamental Baptist Ministries) Conference in Bangkok the first week in November. Excellent preaching by international pastors addressing the theme, “The Lostness of Man – the Heartbeat of God,” highlighted the four-day event. Each association brought a ten-minute report of God’s work in their region. During the business meeting, the representatives elected a new Council of Eight, representing four continents. The new council chose Dr. HC Stephen, international representative of the New Testament Baptist Church Association, Manipur, India, to serve as the new chairman for the IPFBM. Also, the representatives welcomed the Fellowship of Biblical Baptist Churches in Manipur as the newest partner bringing the total to 61 partnering associations. Please pray for sister churches in the GARBC as they proclaim the gospel this Christmas season. Often people attend church services and events at Christmas who might not otherwise come into a church. Pray for the clear proclamation of the gospel and for the Holy Spirit’s working in unbelievers’ lives. Pray for Christmas outreach services in churches. 27, 28: ESF Holiday Getaway, Radisson Hotel, Corning, N.Y.
30: BNN Teen Leadership Conference, Washington Family Ranch, Antelope, Ore.
1: BNN Teen Leadership Conference, Washington Family Ranch, Antelope, Ore.
20–22: CARBC Christian Workers’ Retreat, First Baptist Church, Cambria, Calif.
27–29: BNN Pastors’ Prayer Summit, Camp Gilead, Carnation, Wash.
31—Feb. 2: WARBC Teen Winter Blast, Camp Fairwood, Westfield, Wis.
30: Participating in home church, Great Commission Baptist Church, Schaumburg, Ill.
1: Berean Baptist Church, New Castle, Del. Participating in home church, Daniels Road Baptist Church, Ft. Myers, Fla.
Posted in Association Updates, December 2013, e-INFO on November 25, 2013.